Work on the database that I am building for keeping track of observations of ringed birds has progressed well over the last few weeks. So much so that I have now started using it. I have also officially renamed it to Marked Birds Database (I thought long and hard about a more catchy name but failed miserably. If you have one, let me know). The Bird Overview screen is the main screen to work from. 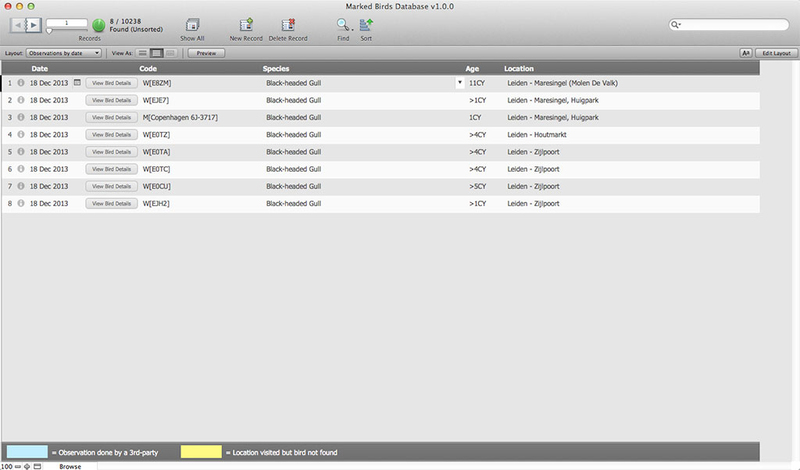 Before using it though, I first implemented a small re-design of the Bird Overview screen. 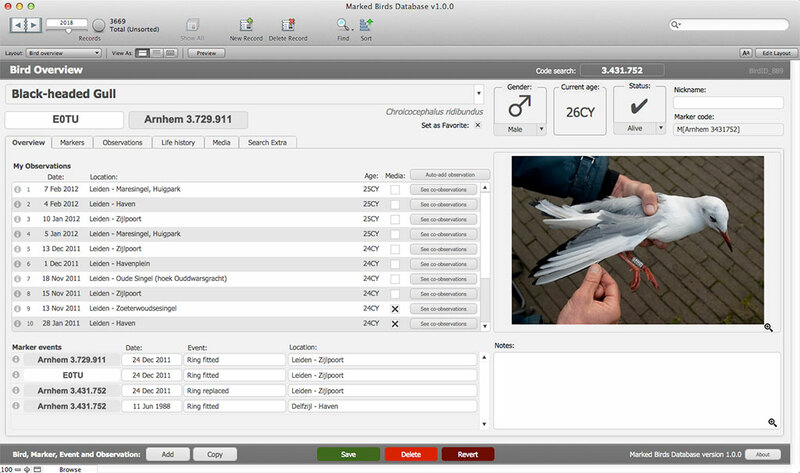 This is the main screen that shows a summary of the bird details and its history and provides access to supporting features such as adding observations. I wanted to be sure that it only contained the essential information and that it was not full of information that was not really relevant to show (as I have done with databases in the past). The best test of a new piece of software is to actually start using it, so after having implemented all the features that I thought had to be in there for basic use I felt comfortable enough to actually start using it. I also cleared all records and did a fresh import from my previous database just to be sure that I wasn’t missing any information. This also meant that I officially stopped using the previous database (the FileMaker Pro 11 version): quite a mile stone in itself. As soon as I started using the new database, areas that needed attention quickly revealed themselves: some workflows did not make sense, features needed to be duplicated in other screens, scripts needed to be improved, bugs needed to be fixed, and so on. Although some features still need tweaking, the functionality of the database is now stable enough for me to show them here. Adding a bird with markers together with the events when these markers were added, observed lost, replaced, etc. Adding a bird by copying the details of another bird, including marker details and marker events. Marking a bird as ‘favorite’ so that it can be easily searched on. Automatically adding an observation by using pre-filled information (date, location, observers, notes). Adding observations made by other observers and distinguishing them from observations made personally. Viewing all observations for a particular bird. Viewing all observations for a particular day (in list form or in detail form). Viewing locations in Google Maps. Copying location details from one observation and pasting them into another observation. Copying details from one Marker Event and pasting them into another Marker Event. Adding the life history of a bird in plain text, as a PDF, as an attachment, or as a Web link. A life history is the info received from the person or organization who fitted the bird with markers. It typically lists the date and location where the bird was fitted with markers and where the bird was observed since. Adding an unlimited number of images to an observation or a Marker Event (for instance images of when the bird was fitted with a marker). Easily scroll through multiple images. View images in a larger size. Assigning an uploaded image to the Overview page as a representative image of a bird. By using the ‘Favorite’ status. By using multiple criteria (search extra). Marking an observation as submitted to the ringer or organization. Marking an observation as received from the ringer or organization. After returning from a day out gull watching, several ringed gulls have been observed. 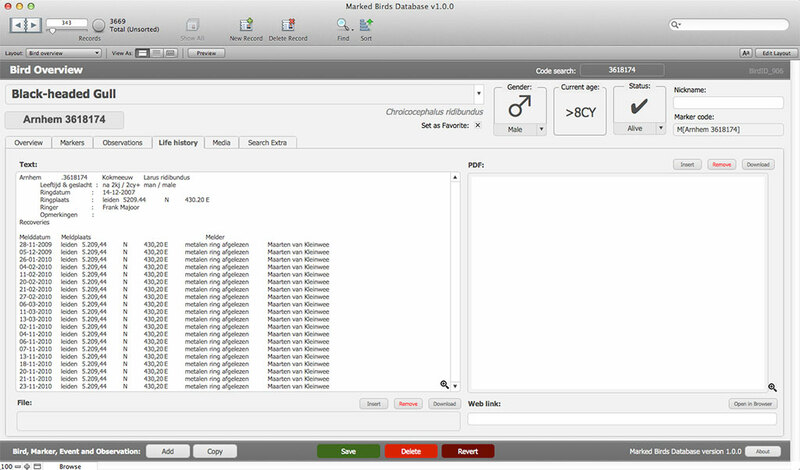 Some ringing projects do not yet exist in the database, while others do. All gulls were seen at the same location. Task: enter all birds into the database with the least amount of repetitive steps. Several photos are available for a bird: photos that belong to observations and photos of when the bird was fitted with rings. One photo needs to be assigned as the main (representative) photo of the bird. Several ringed gulls have been observed, some of them at the same location. 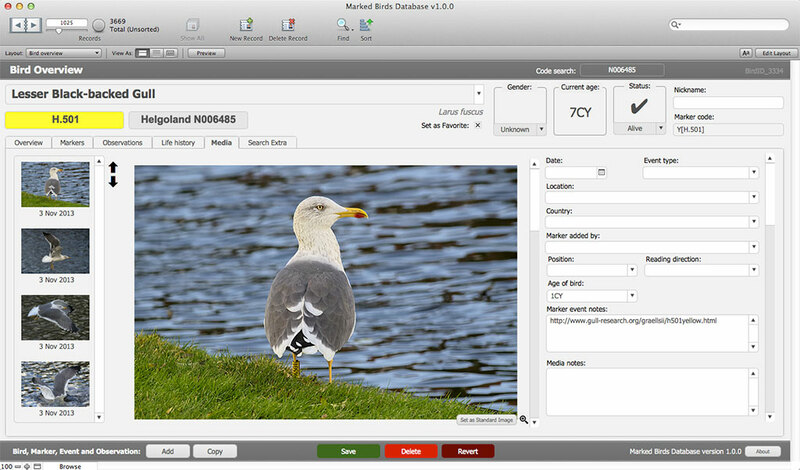 All gulls already exist in the database, so only an observation has to be added for each gull. Task: enter all observations into the database with the least amount of repetitive steps. The ringing details have been received, showing when and where a bird was ringed and where it has been observed since. Task: update the database with this information. The Markers tab shows a detailed overview of the Markers and their Events. The Observations tab shows all logged observations for a bird. Colors are used for indicating that the bird was not present or when the observation was made by another observer. 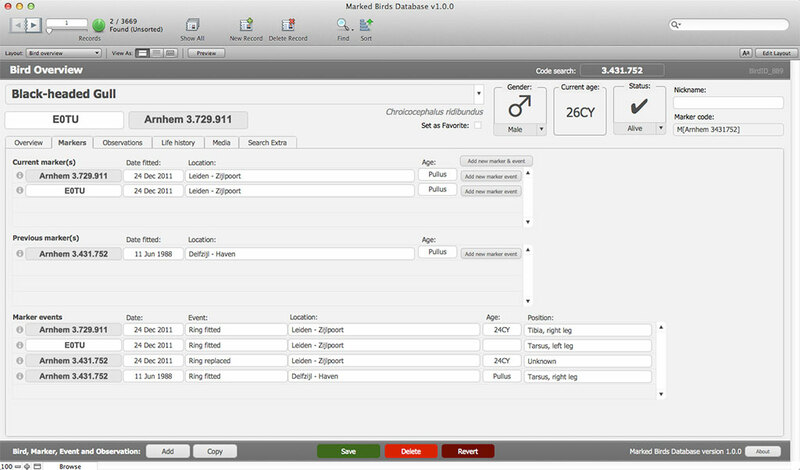 The Life History tab is used for storing the life history information as it was received. It can be stored in plain text, in PDF format, as an attachment, or as a link to a Web site. The media tab shows all images that have been added for all observations as well as for all marker events. 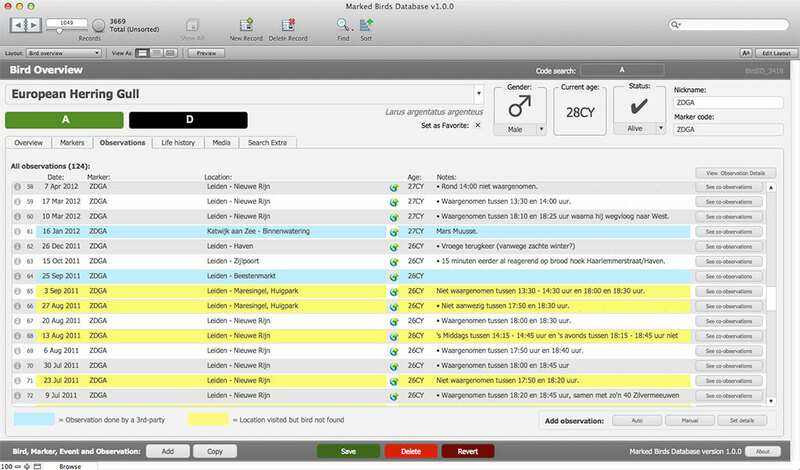 This screen shows all observations for a particular date and is a good starting point for processing those observations. The coming weeks I will continue to test the current features, tweak them and add new features (I still have a long list that I want to implement).